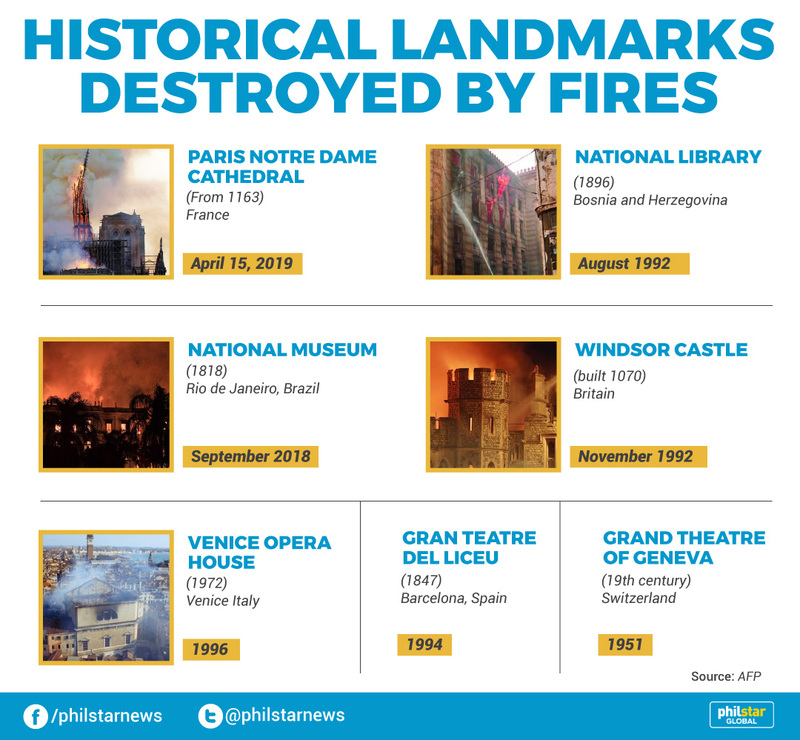 PARIS, France (Updated 11:54 a.m.) — Before Notre Dame Cathedral in Paris, engulfed in flames on Tuesday (Manila time), several heritage landmarks around the world have been either completely or partially destroyed by fires. Here are some examples. The intense heat cracked its magnificent 16th-century stained glass Rose Window into tens of thousands of pieces but it was able to be painstakingly repaired. Restoration work on the minister was completed in 1988 at a cost of £2.25 million (around £5.1 million, $6.7 million today). Several specimen of species that disappeared in the blaze included giant sloths and saber-toothed tigers. It took 250 firefighters working 15 hours and pumping more than 6.5 million liters of water to bring the blaze under control. 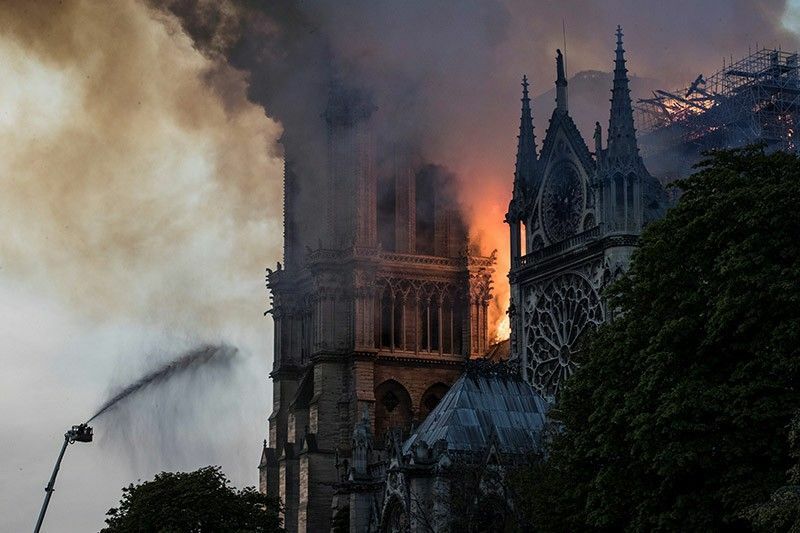 Follow updates on the Notre Dame Cathedral fire here. According to the Ifop poll for the Journal du Dimanche just 29 percent of people polled said they are satisfied with the job Macron is doing, with 69 percent dissatisfied. This April reading was unchanged from the last poll in March, the newspaper said. French President Emmanuel Macron hails as "exemplary" hundreds of firefighters who saved Notre-Dame in the devastating blaze, as efforts intensified to shore up the still fragile cathedral. Catholic worshippers feeling orphaned by the fire that ravaged part of Notre-Dame will be welcomed in an "ephemeral cathedral" of wood in front of the Paris monument until it reopens, Notre-Dame's chief priest says Thursday. Speaking to France's CNews television channel Monsignor Patrick Chauvet says: "We mustn't say 'the cathedral is closed for five years and that's it'. To give the faithful somewhere to congregate next to Notre-Dame, he suggests: "Can I not build an ephemeral cathedral on the esplanade (in front of Notre-Dame)?" Paris Mayor Anne Hidalgo had backed the idea and agreed to give over part of the esplanade to the church for a wooden structure, he says. Fraudsters are taking advantage of the Notre-Dame fire to fool donors into handing over cash believing they are helping to rebuild the gutted Paris cathedral, officials warn.